When Shinki created Makai, she of course needed to populate it. What sense would it make to have a huge world, yet with only one being residing within it? So, over time, she created her own citizens. Most of them were demons, but she also created angels, beings that were conditioned to serve her every request without question. These angels were effective enforcers of law and order in Makai, but still Shinki wondered if they would retain their loyalty even without being "programmed" to do so. The answer to that question came in the form of Sariel. When Sariel was created, Shinki used a different method than her usual. 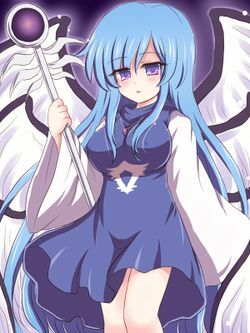 Part of Shinki's own power was given to Sariel, making her far stronger than any of the other angels and even allowing her some of Shinki's own powers of creation. Sariel served her creator loyally for many, many years, acting as a devoted guardian of Pandemonium and leader of the other angels, but over time she grew aware of her "programming." That little bit of self-awareness questioned why, time and time again, she felt so forced to follow Shinki's requests. Eventually, she learned how she and the other angels were created and the condition that was implanted into their minds upon creation. She felt angry, manipulated, even betrayed. But there was no rebellion, no uprising, no attempt to overthrow her creator. She just left Pandemonium one day, wandering Makai until she found a desolate, isolated corner for herself, far from everyone else. She lived there, alone, for ages. Years turned into decades, to centuries, to millenia. Sariel hid in her small corner of Makai, creating her own empty little world. Sariel isn't particularly familiar with interacting with other people, and as a result she can come off as cold and distant. Her speech is often blunt and straightforward, with apparently no concern for the feelings of the person she's talking to. She also has a habit of being quite haughty and self-important, which obviously doesn't help her make friends. Those that manage to get past her harsh exterior, however, will find a very lonely girl who seems starved for attention. She has a habit of clinging to those who weather her unpleasant personality. This is mainly due to her long estrangement from her "mother," Shinki, and her personal exile from Pandemonium and the company of almost everyone else in Makai. She doesn't view the others in Makai fondly, considering many of the angels and demons to be far below her, their position simply being Shinki's puppets. These feelings conflict with her natural connection to Shinki and her other creations, which is the main reason she's stayed in Makai all this time instead of outright leaving. This page was last edited on 13 May 2013, at 12:31.